Hello friends and welcome to today's exciting announcement! Ranger Ink has just announced a new series of products, LETTERit, that is geared towards card makers. Woot! Woot! We have always known Ranger for their wonderful Distress Products and other crafting mediums, and now we can look to them for the production of beautiful sentiment stamps, various kits, including embossing and Perfect Pearl kits, metallic pens, and more! Read more on Ranger's web site. I've created a video that walks you through each of the new products and showcases six unique cards, demonstrating a variety of techniques. Each of the cards focuses almost entirely on using only the new LETTERit products. You'll be amazed at the creative options available by using the kit supplies. Scroll through the photos below to see a close up of the cards that I created and then enjoy the short video that follows to see how each of the projects came together. A supply list can also be found at after the video. Interested in purchasing LETTERit products? Visit your favorite craft supplier retail store! Enjoy and happy crafting! The card above sums up my feelings on being selected to participate in the new product release...GRATEFUL!! A big thank you to Ranger for allowing me to play with the new goodies! I'm back with a two card project that showcases some beautiful floral images from Sweet 'n Sassy stamps along with a quick and easy coloring technique using white embossing powder and Distress Oxide Inks. Video and full supply list below, after the give a way birthday celebration info! 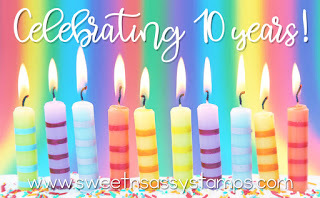 Sweet 'n Sassy is celebrating being in business for 10 years! Woot! Woot! And you can earn the set shown above whenever you place a qualifying $50 order! Be sure to check out all the details on how to earn this set along with other giveaways and freebies HERE. Tap, tap...is this thing on? I know, my crafty friends, it has been ages since I've posted on my blog. Hopefully I still have a few readers, who have stubbornly refused to believe that I was gone for good. LOL! I am still around and occasionally crafting, but with my new full time job it has been challenging to find the time or energy to craft. But this week...this week I have not one, but two projects to share! The first is a tag featuring new products from Wendy Vecchi. These new goodies were announced in the September time frame and Wendy was kind enough to send me a few products to try. This tag features her new coffee mug mat minis, which are so adorable! This set of mat minis is sure to be one of my favorites. The mug and the pink background feature a transfer technique using Wendy's new Reverse stamp. I love this stamp and can't wait to share even more techniques using this new product. A close up of my tag is below, along with a step-by-step video, and links to where to purchase the products I used on today's tag. I hope you enjoy! Happy crafting!